Brisbane is the capital of the Sunshine State, Queensland. The Isla of Pines in New Caledonia was named by early explorer Captain Cook after seeing an abundance of tall native pine trees. Oceania is a continental region between Asia and the Americas. The Australian mainland is the biggest landmass with an additional 10,000 or more islands to its east. Oceania's border is defined more so by surrounding ocean and seas rather than Australia, the single dominating landmass. It is also the smallest continental region in land area and the second smallest in population after the Antarctica. 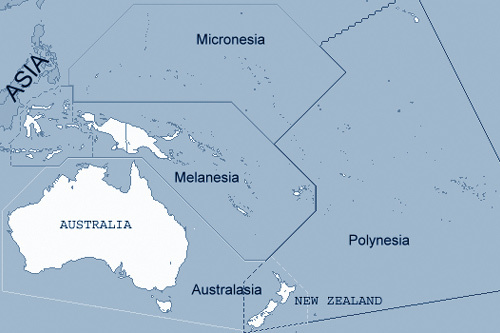 Oceania is composed of four regions: Australasia, Polynesia, Melanesia, and Micronesia. Australasia includes Australia and New Zealand and is by far the biggest region. To put this in perspective, New Zealand is bigger than all the other South Pacific Islands combined and New Zealand fits into Australia nearly 30 times. Polynesia or the Polynesian Triangle consists of New Zealand which is the south-western anchor with Hawaii as the northern point and Easter Island to the east. Although New Zealand is part of Australasia, Hawaii a state of the USA, and Easter Island belonging to Chile, all three are geographically, culturally, and linguistically part of Polynesia. Other island groups and nations in Polynesia include: French Polynesia, Cook Islands, Samoa, Tonga, and Tuvalu. Melanesia lies west of Polynesia and includes New Caledonia, Solomon Islands, New Guinea, Vanuatu, and Fiji. This region is culturally and racially distinct from Polynesia. Melanesians originate from New Guinea. Micronesia to the north is also distinct. Island nations here includes Kiribati, Guam, Marshall Islands, Federated States of Micronesia, Northern Mariana Islands, Palau, Nauru, and Wake Island. Some islands in this region were made famous because of WWII when the Americans fought some very tough battles here against the Japanese. New Zealand has relaxed immigration laws for Polynesians giving New Zealand the largest Polynesian population in the world. Both Niue and the Cook Islands are self-governing states in free association with New Zealand and use New Zealand currency. Both New Zealand and Australia provide assistance in the form of aid and money to Polynesian nations such as Tonga and Samoa, while the U.S has strong ties with American Samoa. France has influence in French Polynesia which includes Tahiti, while Hawaii is a state of the USA, and Easter Island is goverened by Chile. Melanesia has a strong French connection due to French colonisation which is still present in New Caledonia. Papua New Guinea was governed by Australia till it gained independance in 1975. Australia still plays an active role in aid and assistance. Fiji remains completely independent, but receives aid from both Australia and New Zealand in times of natural disasters. Micronesia is self-governing and in free association with the United States which gives the U.S the right to military bases in exchange for money and aid.